“The Hair” is back and she’s really running. In case you missed it, The Hair is Leigh Brown of Cabarrus County. This time, it’s not the Governor’s mansion she’s running for. This time the “DemoPublicanRepubliCrat” is challenging Rep. Larry Pittman for his seat in NC 82. It’s going to be a tough race for her despite the funding from her real estate friends at the Chamber of Commerce. She needs all of her friends to be able to vote for her May 8th. 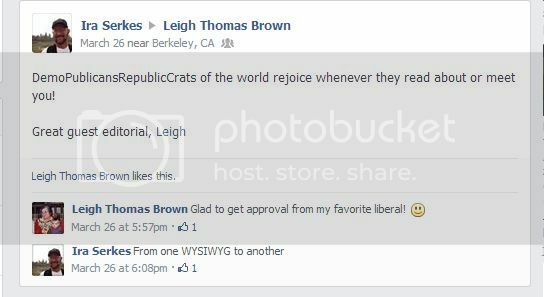 Gray’s company is a “Consulting and implementation for local government, politics, for profit and not for profit organizations, small business and individuals.” Therefore it makes sense she be campaign manager for The Hair and promote The Hair’s realtor friend, Diane Honeycutt. NO DEBATE, YA’LL ARE MEANIES. The Hair has yet to debate Rep. Pittman. She seems so gung-ho, so what’s the holdup? 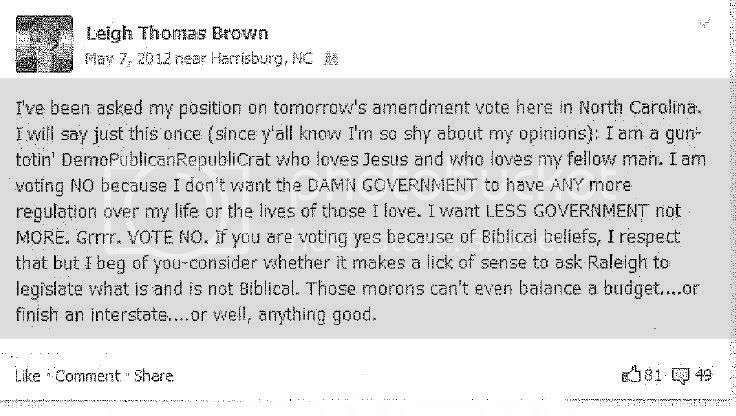 Well, she’s got a problem with the Cabarrus County GOP apparently as she describes in this video. There’s a lot of “waaaahhh!” in it, but it’s mercifully short. The Hair wants a moderator and a neutral setting too — because she’s allegedly a Republican and having a debate with another Republican in a Republican setting would be rough on her, right? In the video, The Hair has also had it with what she calls “harassing comments” on her Facebook page. Harassing, in this case, is translated to mean criticism. Welcome to politics, ma’am. The Hair is already censoring what she doesn’t like – at least on Facebook. Yes, let’s keep it ‘friendly’ and use the same affiliation trick to try to flip other seats. It would seem that right around the same time The Hair was encouraging people to change their affiliation so they could mess with the May 6th vote, so were others in Cabarrus County. You should read the article he links to here. Morris also is endorsing Diane Honeycutt and Grace Mynatt for commissioner spots. Interesting picks or strategic attempts to alter the board? Those running for re-election are; Jason Oesterreich, Chris Measmer & Larry Burrage. Honeycutt is a pal of The Hair and like The Hair, Honeycutt is a realtor. Honeycutt has a big business and philanthropy resume but not much in the way of public office. There seems to be a lot of shenanigans going on in Cabarrus County. Update: Thank you to Carolina Plott Hound for Linking! This entry was posted in ELECTIONS, Err What?, LL1885, NCGA, The Articles and tagged Cabarrus County, Diane Honeycutt, Grace Mynatt, Jason Oesterreich, Larry Pittman, Leigh Brown, Liz Gray, NC82. Bookmark the permalink. 2 Responses to #NC82 Candidate Wants Democrat Votes?